Climate change relates to the long-term interests of Chinese nation and all mankind,so taking the low-carbondevelopment way is an urgent demand to actively respond to climate change,an embodying in the direction of People First,Overall Coordination and Sustainable Development,and also the inherent and objective requirement of building an innovativecountry as well. It has already became a China’s basic state policy and incorporated into Twelfth Five-Year Plan for National Economicand Social Development of People’s Republic of China to establish green low-carbon development concept,to stronglydevelop green economy with the connotation of low-carbon emissions and recycling usage,and to radually set up the industry,construction and transportation systems with low-carbon emission and low-carbon social life,and to actively explore thelow-carbon development road with Chinese characteristics,and to effectively control greenhouse gas emissions,as wellas to positively contribute to promoting sustainable development of both China and the world. For the purpose of comprehensively recording the course and actual situation of Chinese low-carbon development,and speeding up the low-carbon development,China Low-Carbon Yearbook was specially published. Great attention and firm support were given from all involved parties such as from the central to locals,eachnational key industry and its association,and the low-carbon pilot and practice units.The consultants and editors wereinvited from the relevant ministries and commissions(bureaus) of National People’s Congress and the State Council,andthe provincial and municipal National Development and Reform Commission,and relevant experts and scholars.All ofthem positively wrote and provided manuscripts,the information and pictures,and gave many guidance suggestions.Allmentioned above encouraged and spur us to make great efforts to edit China Low-Carbon Yearbook 2015 well. China Low-Carbon Yearbook 2017 basic content focuses on China low-carbon development status and actions in dealingwith climate change,important information/data,experience and major a chievement in 2016.To improve the timeliness ofChina Low-Carbon Yearbook,we collected important policy documents and related contents referring to China’s actions indealing with climate change and low carbon development in 2017. The Deng Xiaoping Theory and Three Representative Important Thought were adhered to and followed,andScientific Development Outlook was applied and implemented during editing of China Low-Carbon Yearbook 2016,whichcombined articles,items,statements and pictures in style,Fully implement the spirit of a series of speeches about greengrowth concept and the construction of ecological civilization by Xi Jinping. 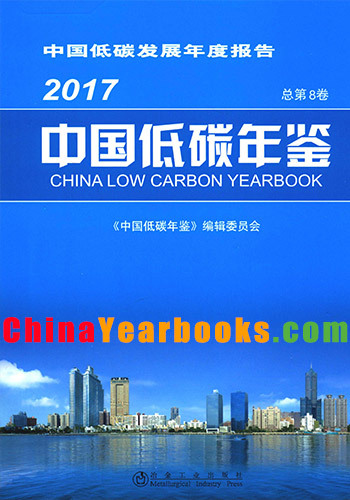 China Low-Carbon Yearbook 2017 has some obvious features as follow:Efforts to strengthen the comprehensiveanalysis of income of the National Development and Reform Commission issued the “China’s National Climate ChangePolicy and Action Annual Report”,invite the relevant ministries and commissions of the State Council,key industries andareas,provinces,experts authored papers and other climate change and low carbon development and thematic developmentreport,which greatly enriched the “Yearbook” content,and enhance the “Yearbook” readability,use value and historicalvalue.The incidents,information,data,materials,pictures and etc.recorded are all from the official and open publicationswith authority and authenticity,which have high historical value,and high storage,usage and reference values;contentscovered are more comprehensive,broad and systematic,from the central to locals,so as enterprises,parks,each industryand field,speech and views,major activities and events,regulations,policies,science and technology,and typical cases andforeign profiles,involving each aspect of low-carbon development at multi-level and all-dimension.The book with more than2 million characters is rear before owing to its large scale and rich,accurate and complete content;excellent pictures andtexts,with strong visibility,vitality and readability. China Low-Carbon Yearbook is supported by grants project of China Clean Development Mechanism Fund. 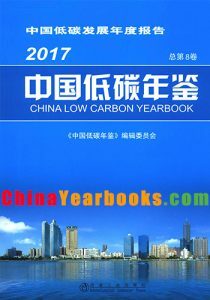 Sincerely thanks to the related ministries and commissions(bureaus) of National People’s Congress and the State Council,every provinces and cities,the national key industries and their associations,low-carbon pilot and practice units,expertsand scholars etc.for their supports in the editing and publishing of China Low-Carbon Yearbook 2016. We are of inexperience and of limited level,for the omissions and errors existing in the book,please point out withoutstint. Climate change relates to the long-term interests of Chinese nation and all mankind,so taking the low-carbondevelopment way is an urgent demand to actively respond to climate change,an embodying in the direction of People First,Overall Coordination and Sustainable Development,and also the inherent and objective requirement of building an innovativecountry as well. It has already became a China’s basic state policy and incorporated into Twelfth Five-Year Plan for National Economicand Social Development of People’s Republic of China to establish green low-carbon development concept,to stronglydevelop green economy with the connotation of low-carbon emissions and recycling usage,and to radually set up the industry,construction and transportation systems with low-carbon emission and low-carbon social life,and to actively explore thelow-carbon development road with Chinese characteristics,and to effectively control greenhouse gas emissions,as wellas to positively contribute to promoting sustainable development of both China and the world. For the purpose of comprehensively recording the course and actual situation of Chinese low-carbon development,and speeding up the low-carbon development,China Low-Carbon Yearbook was specially published. Great attention and firm support were given from all involved parties such as from the central to locals,eachnational key industry and its association,and the low-carbon pilot and practice units.The consultants and editors wereinvited from the relevant ministries and commissions(bureaus)of National People’s Congress and the State Council,andthe provincial and municipal National Development and Reform Commission,and relevant experts and scholars.All ofthem positively wrote and provided manuscripts,the information and pictures,and gave many guidance suggestions.Allmentioned above encouraged and spur us to make great efforts to edit China Low-Carbon Yearbook 2015 well. China Low-Carbon Yearbook 2015 basic content focuses on China low-carbon development status and actions in dealingwith climate change,important information/data,experience and major a chievement in 2014.To improve the timeliness ofChina Low-Carbon Yearbook,we collected important policy documents and related contents referring to China’s actions indealing with climate change and low carbon development in 2015. The Deng Xiaoping Theory and Three Representative Important Thought were adhered to and followed,andScientific Development Outlook was applied and implemented during editing of China Low-Carbon Yearbook 2015,whichcombined articles,items,statements and pictures in style,Fully implement the spirit of a series of speeches about greengrowth concept and the construction of ecological civilization by Xi Jinping. China Low-Carbon Yearbook 2015 has some obvious features as follow:Efforts to strengthen the comprehensiveanalysis of income of the National Development and Reform Commission issued the”China’s National Climate ChangePolicy and Action Annual Report”(2014 and 2015 years),invite the relevant ministries and commissions of the StateCouncil,key industries and areas,provinces,experts authored more than 30 papers and other climate change and low carbondevelopment and thematic development report,which greatly enriched the”Yearbook”content,and enhance the”Yearbook”readability,use value and historical value.The incidents,information,data,materials,pictures and etc.recorded are allfrom the official and open publications with authority and authenticity,which have high historical value,and high storage,usage and reference values;contents covered are more comprehensive,broad and systematic,from the central to locals,so as enterprises,parks,each industry and field,speech and views,major activities and events,regulations,policies,scienceand technology,and typical cases and foreign profiles,involving each aspect of low-carbon development at multi-level andall-dimension.The book with more than 2 million characters is rear before owing to its large scale and rich,accurate andcomplete content;excellent pictures and texts,with strong visibility,vitality and readability. China Low-Carbon Yearbook is supported by grants project of China Clean Development Mechanism Fund. Sincerely thanks to the related ministries and commissions(bureaus)of National People’s Congress and the State Council,every provinces and cities,the national key industries and their associations,low-carbon pilot and practice units,expertsand scholars etc.for their supports in the editing and publishing of China Low-Carbon Yearbook 2015. We are of inexperience and of limited level,for the omissions and errors existing in the book,please point out withoutstint.